I did not do any posting while One World One Heart was running......HOWEVER>>>>> that does not mean I was not busy creating! 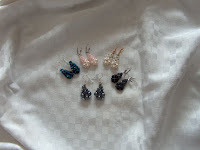 I made several pairs of earrings using swarski crystals, and pearls. 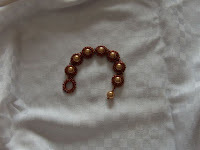 I am using a differnt clasp which I find very comfortable and very secure on the ear. I used pearls along with crystal.The different colors available are black, white, blue, grey and pink.Other colors will come along soon. 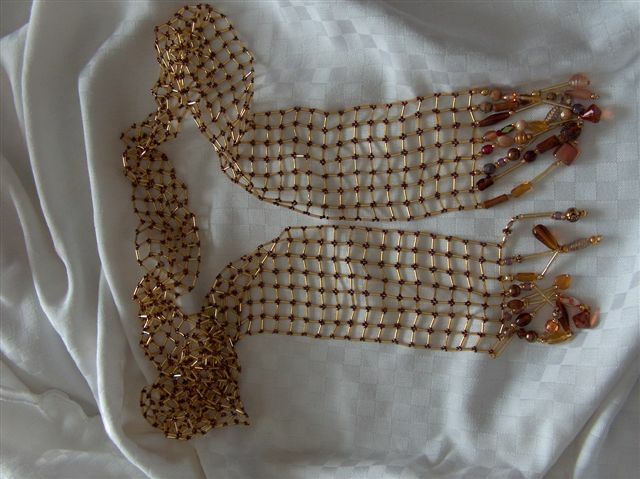 I completed this 60" beaded scarf using gold bugles and bronze seeds. 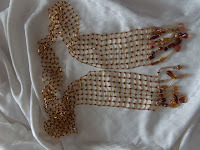 The fringe is an assortment of bronze and amber beads and charms. 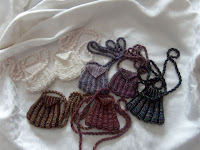 I was working on some beaded amulet bags in different colors. Wouldn't the white/cream pearl ones would be pretty for a bridal gift to her attendants. I have to finish the flaps yet using more beads and charms .. They have a generous length rope which seems to accomodate most bodies. 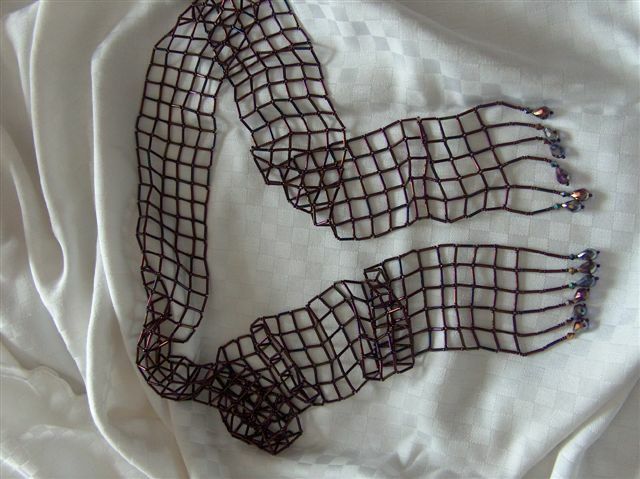 And here is another beaded scarf done in a glorious shade of plum iris bugles and matching seeds. The drop crystals are a beautiful deep amythest. Any of my items are for sale along with free shipping. Email me with any questions. You certainly have been busy! Nice work too. Thanks for stopping by Freebird and leaving your compliments....I really appreciate seeing you..
Wow! You have been busy!!! Almost all of my beads are packed. I wonder if the pearls will crack since we got so cold? Hope not! You have been a busy little bee. All your creations are just awsome. I never thought of scarves out of beads, but they are gorgeous!!! Didn't you just LOVE Pat's new CQ magazine? Maggie..your beaded items are beautiful. I made the same earrings last year...gave most away as gifts. I love your neck purses...how about a trade...:-D Sending ♥♥♥'s your way! That scarf is really a gem, Maggie! And the photo at the top of your blog....makes me sad Winter is going..